Celebrating a new year in the month of February may seem strange to some, but for Asians it is a part of their culture, customs and heritage. California Baptist University’s International Center and Community Life partnered this year to host a Lunar New Year Festival for the CBU community to learn about Asian culture and traditional customs. “We wanted to encompass not only Chinese, but Korean and Japanese (cultures) who celebrate the lunar calendar,” said Megan Adams, senior English major and international event coordinator at the International Center. Lunar New Year is commonly referred to as “Chinese New Year,” but many other countries in Asia, such as Singapore, Malaysia and Vietnam, celebrate it as well, which is why the hosts decided to call it by its correct name. “We wanted everyone to know more about the Lunar New Year, and just enjoy and celebrate together,” said Justin Park, graduate student at CBU and assistant at the International Center. Celebrate and enjoy themselves they did, all thanks to the engaging activities, Asian food, games and live entertainment provided. While fun and entertaining, each of these elements helped students of all backgrounds learn something about the Asian culture, while giving those who are a part of the culture a sweet reminder of their families back home with whom they did not get to celebrate the new year. 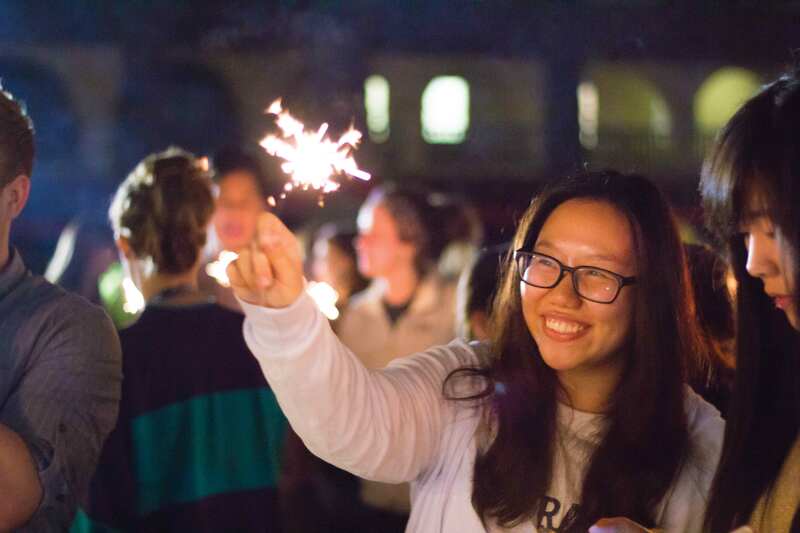 “I’m Chinese, and I celebrate Chinese New Year with my family at home in San Francisco, but since I can’t this year, it’s just nice to celebrate it here with friends with some of the same traditions,” said Christina L. Chun, junior health education major. Some traditions incorporated into the festival included red paper lanterns strung throughout Hardin Square, lion dancing, shoalin kung fu martial art performers, red envelopes with money and special hand-written blessings in Chinese calligraphy by CBU’s very own Chinese ministry. Hui Yin, junior business adminstration major and member of Caihong Fellowship, the group that put on the performance, said the songs they sang are traditional in China this time of year. The main reason for the festival was to promote friendships between CBU’s international and American students. Diverse as the CBU community is in cultures, races and ethnicities, attendees of the Lunar New Year Festival left with a better understanding of the Asian culture and appreciation for its international students.